We drove through Sinalunga and Torrita until we saw the sign to Belagaggio on our left. We took the dirt road up (bearing right at the fork) to the special place we would call home for the next four nights. The bright sunny day brought the beauty of this Tuscan paradise into focus with its fertile green hills and valleys as far as the eye could see. A short distance away, the ancient walled town of Montefollonico sat on a hillside, surrounded by cypress trees. The air was sweet but not as sweet as Ada and Antonella (mother and daughter) who cheerfully welcomed us to their home and whisked us into their first floor kitchen for fresh espresso (we passed on the goodies). Despite the language barrier, we managed to exchange pleasantries as we always do in these situations. It just takes a desire to communicate and somehow you make it work. The property on fifteen hectares, five of which are forest, is everything you could want in an agriturismo experience. Antonella's husband, Sergio (what a sweet guy!) restored and rebuilt all the buildings with great professional skill and love. The stone work is spectacular and the apartments are finished with beautiful woodwork, beamed ceilings, ceramic tile floors and top quality furnishings and fittings. There are apartments suitable for two or four persons (one specially designed for wheelchair accessibility) all with fully equipped kitchens for guests who prefer to prepare their own meals. Half board is available and after experiencing it, we would recommend it. The family grows most of their produce and their vineyards produce wonderful wine and liqueur. A pen with a small pond is home to ducks, chickens, roosters and a few other feathered friends. All the foods served here are natural and fresh, either produced on their farm or on others nearby. There is a lovely swimming pool and patio with wide open views of the landscape beyond. If you feel like having a barbecue, a beautiful brick one is there for your use. Horseback riding is available on the property as well as table tennis and mountain bike rentals. The family can guide you as to the other activities available in the area. We were the only guests (it's great being just ahead or behind the season) and were given a choice of apartments. We chose one with a nice large bedroom because the TV was in that room. The front room, a combination sitting room and kitchen, was good size as was the beautifully done bathroom with heated towel rack and stall shower. We wound around a few curves in the road and a few hilltops away we parked outside the ancient hamlet of Montefollonico. We walked in through the handsome gray stone gateway into an adorable medieval setting. We were impressed by the beautifully built and well maintained homes, particularly those along the perimeter with large patios overlooking the valleys below. We met a trekking Elderhostel group who had stopped for lunch at Ristorante 13 Gobbi and highly recommended it. It is located just inside the town entrance we used. The place was a housekeeping wreck from the trekking crew but the staff was working feverishly to clean and reset the tables and after assuring us there was still plenty of food in the cucina, a table was ready for us. Lots of Tuscan environment, a hearty appetite and the guidance of an attentive owner and we were off to a good start. We shared coniglio (rabbit) roasted with herbs, wine, garlic and balsamic vinegar. The chunky, meaty pieces were tender, juicy and delicious. The assorted vegetables we selected were outstanding, particularly the roasted baby onions and the pan fried potatoes and onions. Everything was very fresh and skillfully prepared. Back at our apartment, there was a knock on our door and to our surprise and delight we were greeted by two priests and a group of children making the rounds, blessing all the properties in their parish prior to Easter. When Linda asked if she could take pictures of the ritual, they quickly agreed - and posed. We would be dining in the family home with the family and sharing their typical meals, which for us was pure delight. In season, meals are prepared and served in the kitchen/dining room in one of the other buildings. When we arrived, we met Nonna Annunziata, Ada's elderly mother-in-law, who was busy making a fire for us since it was quite a chilly evening. 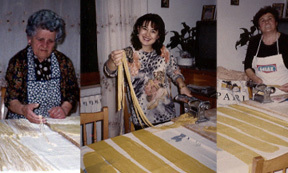 Ada was at the kitchen table rolling out and cutting papardelle, which before long we were eating with a fabulous, meaty ragu. Antonella was in the cucina behind, working on the rest of the meal. Here were three generations of hard working women lovingly caring for their family and guests. The table was cleared and set for dinner. Sergio opened and poured excellent red wine that originated in the Belagaggio vineyards. His and Antonella's children, Gloria and Giorgio, joined us after finishing their homework along with Gloria's twin friends who were visiting. After the pasta course, we had roast chicken, pan fried potatoes and green salad. Dessert was a moist plain cake and seven days old Pecorino di Pienza. Homemade liqueur from white grapes, which tasted like sweet brandy, was Sergio's treat along with delicious Grappa. Despite the language barrier we would look forward to the evening meal with the family to share the events of the day. We arrived about half an hour early to watch the women prepare the pasta and poke our heads into the cucina to enjoy the aroma and sneak a peek at what was in store. All of Ada and Antonella's meals were simple but exquisite preparations of traditional Tuscan recipes such as papardelle or pici with ragu, ribollita (slow cooked soup of bread, beans and vegetables), sautéed veal (lightly breaded, with a bit of sweet wine), coniglio umido (stewed rabbit) and the best roast lamb we had ever had (cut with a fork - a flavor to die for). Side dishes such as a pan fried mixture of rice, flour, eggs, lemon, orange and sugar in the form of small pancakes, home made prosciutto and cured pork filet with a touch of fennel and, of course, crostini with liver, anchovies and capers. We shared a simple breakfast of fresh bread and homemade plum preserves with the ladies (the men and children were off even earlier) and we were off to Pienza, twenty five minutes away. We last visited this idyllic city in 1998, during the annual cheese festival. The only difference on this day was the absent hordes of visitors and the food stands in the street. We parked in the same lot, where today a daily market was in progress. The only activity was in the main square, Piazza Pio II, where the few tourists were taking photos of the Duomo, Palazzo Piccolomini and Palazzo Borgia (Museo Diocesano). The main street is Corso Rossellino, which is lined with mouthwatering food and wine shops, most of which were fairly busy. We particularly enjoyed the stone and brick walkway along the south side of town bordered by plants and flowers with convenient places to sit and enjoy the sights of the valley below. We got on the road back to Montefollonico toward Torrita where we picked up highway 327 (via D. Arezzo) to number 128A, the location of the outlet leather store, Rodopel, recommended by a Ziner. The store was filled with fashionable new Spring leathers at excellent prices. Linda was in the market for a fall/winter jacket and after she managed to communicate this to the staff, they summoned the owner who was the only one with the key to the rear vault where the previous season's stock was stored. It was worth the wait and Linda was completely satisfied with her purchase. Great stuff at bargain prices is good. Having passed Torrita di Siena many times, we were anxious to spend some time exploring this north-south crossroads. Unfortunately we missed the Saturday market but we were in time to see the preparations for next week's Palio dei Somari, where the neighborhoods of the town compete in time honored ways, donkey racing being the feature. Each neighborhood has its own symbol and flag; as we strolled the narrow, hilly streets, the visual impact of the colorful flags waving from the lovely well preserved homes, it was easy to get caught up in the excitement that gripped the town. 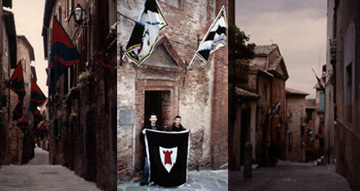 At the main square, two young men were practicing intricate flag waving movements. The backdrop of the medieval Palazzo Comunale, Teatro Comunale and the Chiese di S. Flore e Lucilla made it a memorable sight. When they stopped for a break, we asked them about the event and they took us to their neighborhood (Porta Nova) headquarters in a tiny, renovated old church, showed us albums from prior years and did their best to explain it all to us. They were disappointed we wouldn't be there for the festivities. We sure hope they won; their spirit and friendliness deserved a reward. Torrita does not seem to be a tourist destination. We don't want to spoil it but it is a special place. Now Montepulciano is a tourist town. We were there in 1998 and not much has changed except there seemed to be more deterioration and not much being done in the way of restoration. We parked at the lower end of town and entered through Porta Prato. As last time, we strolled onward and upward, first past an array of enotecas and restaurants, then old mansions and palaces and finally at the top, we passed through the fortified walls into Piazza Grande, home to the cathedral and town hall. We took a different route going down, looking for Osteria dell'Acquacheta v. del Teatro, 22 Tel. 0578 758443, which we had read good things about in a local publication. The review was quite accurate, typical Tuscan food, small portions at fair prices. The baccala (cod fish) al forno with sliced potatoes was my choice and Linda's was eggplant Parmigiano. We shared a salad of wild greens and a side of overcooked spinach, but the ricotta cheese pie for dessert made up for it. The osteria is small with shared tables and the mandatory stucco, brick and wood beams are abundant. The open kitchen in the rear generated delicious aromas. Florentine steak appeared to be a favorite; it looked and smelled terrific as our neighbors cut and chewed away. We knew what to expect at dinner at Belagaggio so moderation was the order of the day. Montalcino is west of Pienza and San Querico D'Orcia and Bagno Vignoni are just south. All three were our destinations for our last day in Tuscany. Montalcino is 1845 ft. above sea level on top of a hill (what else?) that dominates the valleys of Orcia, Arbia and Ombrone. The town is linked to the fame of the prestigious red wine Brunello di Montalcino. It is surrounded by a wall through which there are six gates and the remains of nineteen towers. Our first stop was the powerful Rocca (fortress) built in the second half of the fourteenth century, which remains in excellent condition. Besides splendid panoramas, a walk through the town was a great tour of medieval buildings like the old town hall in Piazza del Popolo with its high tower, the monumental open galleries and Gothic arcades and the cathedral in neoclassic style built on a parish church of the year 1000. It was Sunday and families and young people were out in force enjoying the fine day. While walking past via Ricasoli 32, on the way into town from the fortress, we glanced down to see a busy clean kitchen, a level below the street, at the rear door of Osteria di Porta al Cassero, via della Libertá 9, Tel. 0577 847196. As this was our last day to feast on Tuscan delights, we hoped it would be a good choice. The nose and eyes did not fail. This tiny, plain osteria with an outdoor patio for good weather, turned out to be a gem. We were lucky to get the last, unreserved, table and saw people who arrived after us turned away. The owner is on duty all the time to meet and greet and make sure all is going well. The sweet waitress advised us that the portions were large and to take that into account in our ordering. We both started with fresh mushroom soup, a funghi lovers dream. The next course kept us on cloud nine; scottiglia di cinghiale con fagioli all'uccelletta (wild boar stew with white beans) was triple T - tasty, tender, terrific! A side of grilled vegetables and the superb local red wine rounded off the meal - almost. The waitress told us that the tiramisu was not to be missed (we rarely order this ubiquitous dessert) and since her advice had been perfect until now, we (mistakenly) shared one portion. Our fondest Tuscan dreams came true; this rendition of tiramisu is not to be missed. Happy and content we rolled into Bagno Vignoni. This is a stone dollhouse village with a picturesque ancient terme right in the middle of town. This place has always been famous for its healing waters. The ruins of the original baths are being restored. They sit at the edge of town overlooking the Orcia valley. Had we not just finished lunch, we'd have been tempted by a few of the inviting restaurants and cafes, some with outdoor patios. Our last stop, San Quirico d'Orcia, is a beautifully preserved fortified village, in fact the fifteenth century walls topped with fourteen turrets are almost intact. The major building is the Romanesque Collegiate Church with its three majestic portals, from which a funeral procession made its way through town toward the cemetery. Just inside the walls is the Horti Leonini, a large, tiered, Italian style park with sculpture garden. San Quirico does not seem to be a popular tourist spot. Combined with Bagno Vignoni, Montalcino and the gorgeous countryside, it's a worthwhile tour. After dinner we said good-bye to Sergio, Gloria and Giorgio because we would miss them in the morning. We will miss them - period - as we will Antonella, Ada and Annunziata whose hospitality and friendship we will keep with us until next time.